Sometimes, it may happen that you forget WiFi password while your PC is still connected to it. You will require this password the next time you connect your PC after a format or if you have entirely deleted the connection. In other scenario, you will be needing this password to connect other wireless devices to your WiFi network. In situation like this, it is a good practice to retrieve forgotten WiFi password before hand. Tracking Internet usage is always an important task when you are using a connection with broadband limits. In Windows 7 we covered NetTraffic to Track Internet speed and usage. There were no inbuilt methods in Windows 7 to perform the same task. 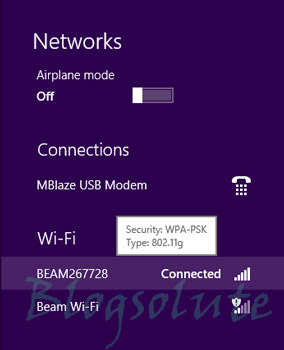 But in Windows 8 this function is inbuilt and can be used with any connection you are using. So, lets proceed with how to perform the above tasks. Retrieving your WiFi password in Windows is easy. Follow the steps given below. Go to Network connection status icon in right corner of task manager. It can also be in system tray if you have dragged it there. Click on the connection status icon and find out with which wireless network you are connected to. Right click on the network you are connected to and click on View Connection Properties. As the Network Connection Properties appears you will find two tabs i.e Connections and Security. On Security tab you can see the security details on the network along with the security key. Check on show characters to get your WiFi network password. With the inbuilt Windows 8 feature, we do not get a detailed session by session tracking. Instead the estimated data usage is shown with total number of usage days. Go to Network connection status icon in right corner of task manager. Click on the connection status icon and select the connected network. Right Click on it and select ” Show estimated Data Usage “. Once the option is selected, you can view the data usage on selecting the network. Bonus Tip: To restrict Windows from Wasting your bandwidth select a connection as metered connection. From PC settings turn off sync over metered connection and other things. Windows 8.1 as of yet doesn’t have the right click option to track internet usage. It is a shame.